Themed around Ancient Egypt, Pyramid: Quest for Immortality (QFI) is a five reel slot game with falls instead of spins and ‘bet ways’ instead of paylines. The game’s theoretical return to player percentage stands at 96.48% and its gameplay includes an Avalanche Feature, wild substitutions, wild generation and an Avalanche Multiplier to crank up potential jackpots. Pyramid: Quest for Immortality is quite a complex and involved slot game which offers players the chance to win potentially life-changing jackpot amounts. Below you will find details of the game’s top jackpot, along with an explanation of the game’s special symbols, paytable and betting limits. The highest possible jackpot of the Pyramid: Quest for Immortality slot is perhaps the most enticing feature of the whole game but how it could be won does take a little explaining. Wins in the game are achieved by three or more matching symbols appearing on consecutive reels from left to right but unlike most games these symbols do not have to form paylines. The payout for any collection of matching symbols is determined by the value of the combination in the paytable multiplied by the bet level and then by the number of identical symbols appearing on each reel. The most valuable symbol in the game is the male pharaoh symbol and according to the game’s paytable, five of those symbols in combination is worth 50. If that symbol were to appear in every space across the reels, therefore, the winning amount can be calculated by this equation 50 (paytable value) x 10 (bet level) x 3 x 4 x 5 x 4 x 5 (number of symbols on each reel). That equals a payout of 360,000 coins but if it were to occur when the Avalanche Multiplier is at the maximum x 10 (this will be explained below) the jackpot would be a gargantuan 3,600,000 coins. At the top coin value of £2, therefore, that results in an extraordinary theoretical top jackpot worth £7.2 million. There are just a handful of different special symbols and features built into the gameplay of the Pyramid slot. These features are the game’s Wild symbols, its Avalanche Feature and the linked Avalanche Multiplier. Wild Symbol – wild symbols within the game work in exactly the same way as traditional wilds and substitute for all other symbols in order to make up the highest possible winning combination on a bet way. The symbols are generated whenever a symbol that lands at the top of reel 2, 3 or 4 is part of a winning combination and they remain for subsequent Avalanches even if they are part of a winning combination themselves. The game’s Avalanche Feature is born out of the fact that symbols appear via falls rather than spins in this particular slot. When winning combinations are achieved after a fall, symbols within the combinations explode and disappear, leaving spaces for further symbols to fall in to place in what is called an Avalanche. Each time three consecutive Avalanches occur, the game’s Avalanche Multiplier increases by one level from x 1 to a maximum of x 10, and that x 10 multiplier remains active until an avalanche no longer produces a winning combination. As you would expect of a game themed around Ancient Egypt the most valuable symbols are those depicting Pharaohs. The male pharaoh symbol is the most valuable of all and has a paytable value of 50 for five symbols, meaning that the top jackpot possible for that symbol is determined by multiplying 50 by the bet level and then by the number of symbols appearing on each reel. If bet level ten were selected and all male pharaoh symbols were to appear after a fall, therefore, that particular equation would be 50 x 10 x 3 x 4 x 5 x 4 x 3 which equals 360,000 coins. Applying the maximum Avalanche Multiplier of x 10, furthermore, gives the ultimate highest possible jackpot of 3,600,000 coins. It is the female pharaoh symbol which is the game’s second most valuable, and five of these symbols have a paytable value of 25. Being exactly half the value of the male pharaoh symbol, that means that the ultimate top jackpot for that symbol is also exactly half the value and so comes in at 1,800,000 coins. Whilst Pyramid: QFI does do away with traditional paylines, it still allows players to set their stake amount by altering both the bet level and coin value per spin. There are ten bet levels from 1-10 which are each worth ten coins and a total of eight different coin values from 1p to £2. To select the minimum possible stake of 10p, then, a player can select bet level one (ten coins) and a coin value of 1p. To bet the maximum of £200, on the other hand, they would simply set bet level ten (100 coins) and a coin value of £2. There’s plenty to like about the Pyramid: Quest for Immortality slot game. It boasts an interesting and fun theme, has exciting and immersive gameplay and most importantly it offers an astonishingly large top jackpot. The Ancient Egyptian theme of the game works well with its use of differently sized reels and falls instead of spins, to give the slot an attractive appearance that will appeal to many players. 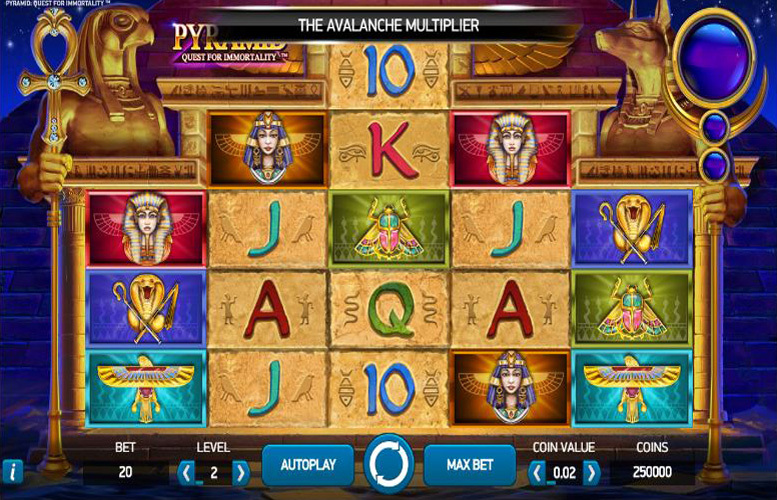 What’s more, the Avalanche and Avalanche Multiplier features of the game also make gameplay more fun and help to hugely increase the potential size of jackpots. It is in that area of jackpots, however, that Pyramid: Quest for Immortality simply blows other competing slots clean out of the water. The theoretical top jackpot of the game is worth £7.2 million and that represents a payout far bigger than any main game jackpot available elsewhere and more generous than most progressive jackpots too. This game has a rating of 5 / 5 with 736 total reviews by the users.